In the early aughts, I purchased a copy of the game Civilization III for my Mac. I have played it ever since, especially after I learned that its copy protection code would mistake a mounted disk image of its CD for the real thing so I could run it without a CD in the drive (no funny business here: I still have the CD and in fact recently came across it). A great casual game, suitable for mindlessly clicking away, I used to play it on the bus home from work. Another regular commuter even accosted me once saying “You’ve been playing that same game for years! Haven’t you ever thought of getting a different game?” I still occasionally play it even though I have several versions of its successor Civilization IV, because III is easier on the battery and improved copy protection in IV doesn’t fall for the disk image trick. Now, its long tenure is coming to an end. Apple is releasing OS X Lion and retiring the PowerPC compatibility layer. Goodbye Civilization III, you will be missed. However, this post is not about Civilization III. It’s about the only other application I use that requires PowerPC compatibility: Quicken 2007. I have now used it for over ten years to manage my finances, track my investments, time and pay my bills, and forecast savings. A couple of weeks ago, Intuit sent out a notice to the effect that Quicken 2007 would not be compatible with Lion, and support for it (such as it was) would end. Customers were advised to migrate to Quicken for Windows (ha!) or Quicken Essentials, their long awaited ground-up rewrite that does take advantage of current SDKs and runs natively on Intel Macs. Unfortunately, Quicken Essentials has significant feature discrepancies compared with the older product. It has no bill pay feature. It also can’t track investments: the web site suggests that you manually enter stock and fund prices which seems to me a slightly less fun proposition than drying untreated wooden plates and spoons with a tea towel. Finally, Intuit states that they “ we are evaluating options for Quicken Essentials for Mac”, which to me sounds like “It’s dead but we won’t tell you yet because we want to get some more revenue out of it” and is not a confidence builder. Report on spending by category, tax table, comparison with previous years etc. Dear LazyWeb, what are your experiences with the above? Any alternatives I missed? The nmap project has, as a technology showcase, created a popularity map of the web. They have taken Alexa traffic data, downloaded the Favicon of each site and made a popularity map of the result. If you search for temme.net, you find that it is just east of Facebook and just north of Microsoft… and it’s certainly not the smallest possible size. Not bad for a little vanity website! Good to know, in case I ever develop ambition in that direction. Wall Street Journal columnist Gary Hamel wrote a while ago about The Hole in the Soul of Business. He correlates the lack of passion many employees of big companies have for their jobs to the sterile language in their published goals and values. I think the problem at hand is that, during the lifecycle of any company, a shift must take place where the commitment to product quality and customer satisfaction becomes no longer the emotional product of a few passionate individuals, but becomes part of the fabric of the corporation. This means that process and procedure takes over from actual people who may care about customers. Said process and procedures bring with them the danger that individuals within the company become disempowered and demotivated. Sadly, it is the only way to scale an operation beyond a few individuals: process and procedures must be put in place to ensure customers have a consistent experience. You can’t put the burden on what few employees you have that happen to be the driven customer satisfaction rock stars. They will burn out and leave, and expose the rotten structure underneath. There is a fine line between empowering and disempowering your employees. If you do it right, employees remain involved, passionate and motivated. If you do it wrong, the customer experience will be consistent, but it will be crappy. Taken to its logical extreme, the only continuing contribution your employees will make to morale is to post Dilbert cartoons on their cubicles. My cousin Bart is quoted extensively on his graduation project resource by the literary supplement to the Dutch national newspaper NRC. For readers who don’t read Dutch, Bart’s thesis is that literary magazines in The Netherlands have lost their significance as a breeding ground for new talent and as a forum for debate about literature. He substantiates this claim by tallying for two time periods (late seventies vs. mid-naughties) which proportion of debuting authors were first published in literary magazines: the decline is considerable. For those that do read Dutch, a summary is available at the poetry blog De Contrabas. This site also make the entire thesis document available. You might also Google for ripples in the literary pond. What do you give the spouse who has everything for their birthday? I certainly did not make it easy for La, since I’m a little too young to want a Harley. So on my birthday, she took me out for “lunch and a surprise”. We drove to the City and ended up in the Japantown mall, so I figured that we might be going to Benihana for said lunch. But, when we got there I was told that Laura had arranged for me to Be The Chef, and cook a Teppanyaki dinner for a party of friends and family two days later! What an amazing idea! That day itself was the training. They sat us down at a table in the back, and taught me how to prepare Splash & Meadow (steak & shrimp), chicken fried rice and hibachi vegetables. Everyone was getting the same choice, to keep it easy. A real chef was going to take care of the second table of friends and family, so they got their choice of entree and the real show. 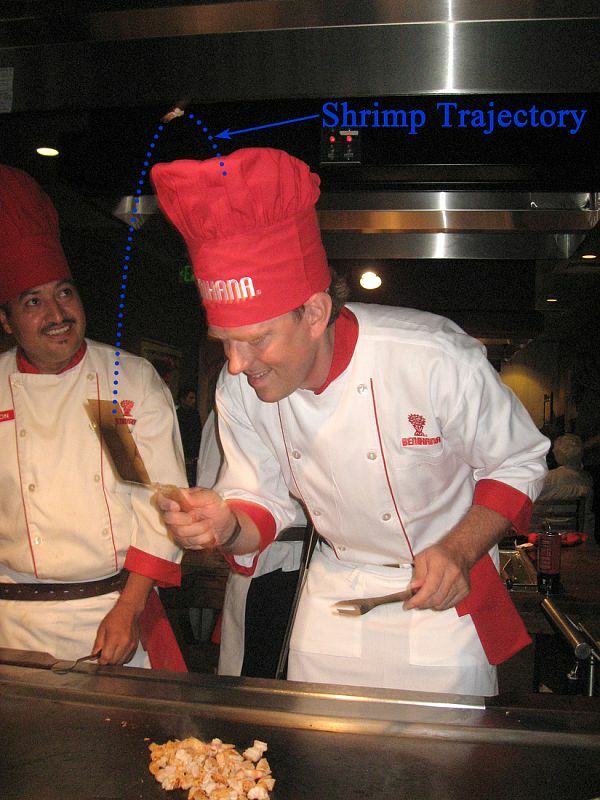 Two real Benihana chefs helped with the training. First, they demonstrated the techniques, pointing out the order in which things happened, how long each step (like cooking the steak) was supposed to take, and the specific cuts, chops and slashes. This became Laura’s lunch. Then it was my turn: I got to try the opening utensil juggle, flip the shrimp tail at my coat pocket (and was given to understand that pontifically putting the last one in your pocket with your fork is a face-saving conclusion in case you miss every one), make the fried rice heart and slice and dice the New York Strip. They had given me a spatula and fork with which to practice the juggling act, so I spent the next afternoon in the back yard with electrical tape on the pointy ends of the utensils, trying out the various flips, tosses and twirls. And areating the lawn in the process. But, in the end I managed to keep from putting anyone’s eye out during the performance. The evening itself was a great success. The head chef of the restaurant, Anton, talked me through the performance and backed me up on the time critical bits. The training involved cooking one serving, but this table had eight hungry people (and one very small one (hi Emma!)) around it! We would typically split up the large tasks: for instance he finished half the shrimp combos and while I got to start all the steaks, I only got around to finishing three. Yes, a professional chef is much faster at this than a dilettante like myself. The shrimp appetizer went very well. Since there are only three shrimp per serving, I got to start, flip and cut all of them. And then, the shrimp tail toss trick. I not only got one in my hat (though I maintain a that hat that big is hard to miss), but also one in my pocket! Yes, I totally meant to do that! Chef Anton demonstrated the scared appetizer shrimp, did a fried rice Mickey Mouse (which I had never seen done before), and I got to do the fried rice heart for Laura. Finally, we did the onion ring volcano. This trick went absolutely flawlessly and you can see the result at the top of this post. Afterwards, I got to taste some of the food and it was actually pretty good! It was a lot of fun to do, and rewarded by a Japanese Steak Dinner in the end. I am very happy Anton helped me and kept me from ruining the food… the special scraper tool came out only twice to restore the state of the grill. In the end, I was very tired but very happy with this amazing birthday party. I would like to thank everyone for coming; the San Francisco Benihana for allowing me to do this; Anton, Junior and George for looking after me; Carol for making it happen and above all, my dearest spouse Laura for arranging it. The Economist has an incisive article on Online TV. Interestingly, I remember having a conversation three years ago about the imminence of Ethernet-connected TVs with social networking built in. What happened? Is it finally coming to us? You must write that song name down no matter how silly it sounds! I have turned on SSL on my site, primarily to be able to log into the management interface of the blog engine over a secure connection. You are welcome to read the blog over SSL. The certificate was signed by Cacert.org, so you will want to download their root certificates and install them into your browser. No guarantees that using SSL will make me post more often. Life has been busy. Cafe La Haye does not need another write-up. However, I have to mention them because we couldn’t remember when last we had a meal out where every course, every dish, was so on the mark. From the Grilled Peach and Prosciutto Salad to the Hand-Torn Papardelle, to the Angus Hanger Steak you could cut with a fork, everything was delicious. The desserts were simply to die for: the Blackberry and Raspberry Fruit Crisp was a simple concept, but so, so well executed. The Chocolate Silk Cake was in delightful harmony with its pecan and walnut crust and the salt accent does amazing things to bring out the flavors. We were hard pressed to not lick our plates. Finally, it was all very reasonably priced. If you plan to hit downtown Sonoma, Cafe La Haye comes warmly recommended.